It’s been almost two years since we got our new dining room table. I’ve been on the look out for chairs ever since. I saw six at the Christie Antique show last spring, but by the time I made up my mind to buy them, they were sold. Argh. So frustrating. I mentioned to Matt the other week that I haven’t been able to get those chairs out of my mind. A couple of days after that conversation, I swung into a local antique store, and right by the front door was a group chairs, very similar to the ones I’d lost out on more than a year ago. 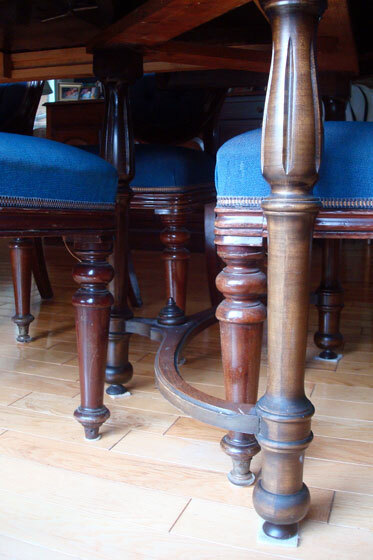 Contrasts with, yet complements, the traditional dark wood table. — These ones pretty much match the table. Reasonably price, especially as I wanted eight. 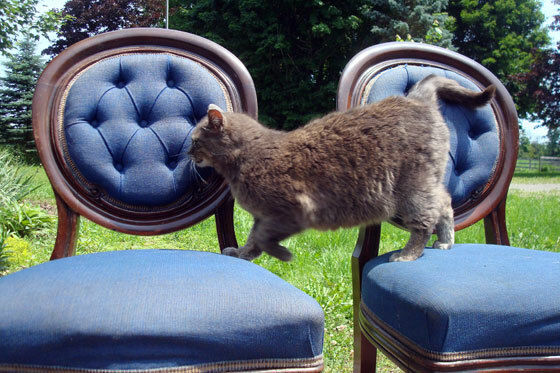 — They were priced at $50 per chair, and there were eight of them. Not upholstered. — Umm… not so much. Upholstered on the seat, upholstered on the back, both the inside and the outside. Slightly country feel. — Not at all. This Chrystiane profile ties into the traditional side of my decorating aesthetic. Despite not matching up with what was originally in my mind, I liked them, Matt was okay with them, and the price was right (especially after I talked the dealer down a bit more). They came home with us. 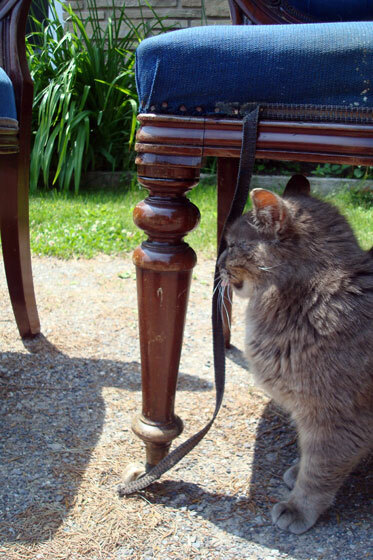 While they were airing out on the driveway, our quality control manager, Ralph, performed her inspection. For someone who lives in a barn, our girl has some definite opinions on furniture. 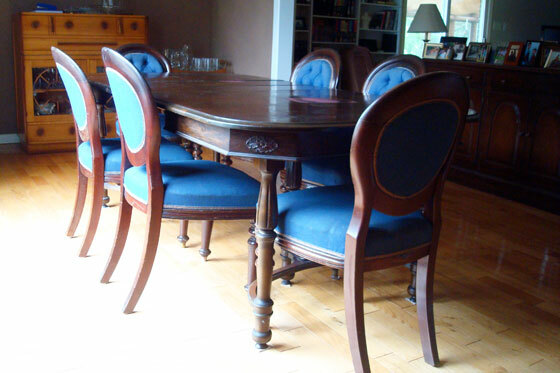 After vacuuming the upholstery and wiping down the wood, the chairs made their way into the dining room. (Ralph returned to the barn). And here’s how they look around the table. Don’t the legs play nicely together? The chairs (and goodness knows the table) will all need to be refinished someday. 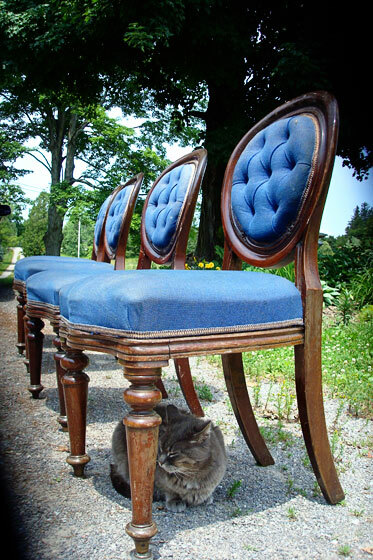 I think I might try some Restor-A-Finish on the chairs first to tide us over. My Mom’s used it a few times and I’ve been super impressed. The upholstery is another issue. Matt is not a fan of the blue. The fabric is mostly in decent shape, but it’s scratchy and faded. Reupholstering looks like it would be fairly basic, aside from the diamond tufts, but eight chairs, seats and backs (both inside and out) would be a lot of work–and I don’t think Ralph would help. It would be fun to try out different fabrics though. I’m pretty sure I remember Sarah Richardson using three different fabrics on chairs like this. Overall, I’m pleased with the purchase, and very happy to finally have chairs that work with our table. What type of chairs do you have at your table? Do you go antique shopping? Who else has a story of the antique that got away? What fabrics would you choose if these chairs were yours? Have you ever used Restor-A-Finish? Who handles quality control inspections at your house? I think they look great! And at $50/chair, that’s a pretty good price! I agree with matt – no crazy about the blue. But, this is where you could have some fun – get some funky patterned, brightly coloured fabric and make the fabric the modern twist. I think it would be fairly easy to reupholster, but might be worth getting the back parts with the diamond tufting done professionally. For the fabric – you could also do a different fabric on the seat than the top, or the back side that faces out could be a different fabric than the rest – I think Sarah Richardson has done that as well. I am going to agree about not caring for the fabric, but with your sewing skills I am sure you can tackle that! Although, I love getting funky with decor once in a while, I think I would go with something neutral so that you didn’t have to recover every few years. We have a 90’s diningroom set. The type with the hunter green base and golden oak top. And chairs to match. Not my style at ALL! But we eat most of our meals at our kitchen bar and a formal table and chairs is not high on our list to purchase. My dream would be a large cherry table with mission style matching chairs. But that is a long way from our budget right now. I think cherry mission style sounds much nicer than hunter green and golden oak. Good for you for using what you have and making choices that work for your lifestyle. The table and chairs look like they were made for each other! It’s funny, as soon as I saw that blue in your other post, I thought it seemed like a “Julia colour”. (Just an immediate impression, I’m not sure what was based on…) But there are many fabric choices that would be gorgeous as well. 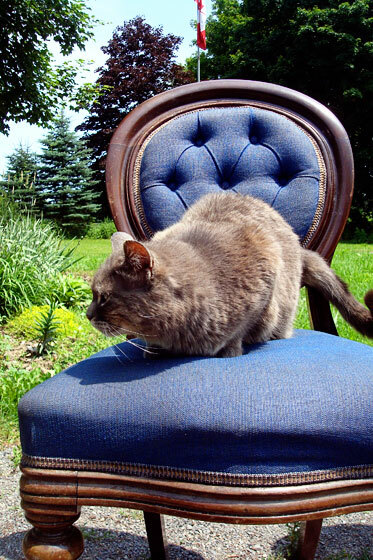 I recovered an antique chair by painting the wood blue and using a zebra fabric – it was for my step-daughter who loves animal print and blue anything – and it turned out beautifully. It’s not as hard as I was afraid it might be. That chair sounds great. It’s so nice of you to personalize it like that for your step-daughter. I love when Ralph is on the blog! 🙂 I agree, I think the table and chairs look great together too. I even like the blue, but if you decide to do something else with them in the future I’m sure you’ll make them look even better. Also, good for Ralph for not scratching them! I feel like my cats would have! I thought you might like seeing her! 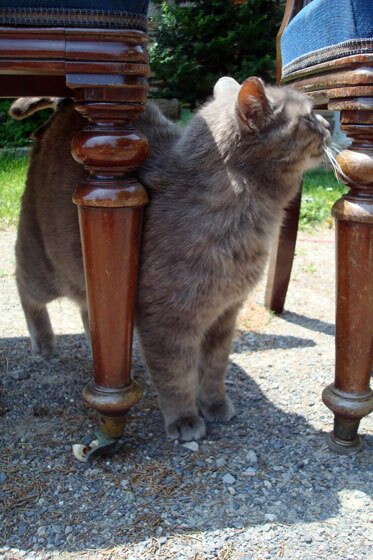 She obviously has a full set of claws (hello, barn cat), but she didn’t see the chairs as scratching posts. She has her favourite barn beams for that!